I’m Lynne and this is my first ever online project! I am so excited to be on the Design Team for Crafter’s Cupboard and have the opportunity to play with the wonderful products they have to entice and inspire the creative process. 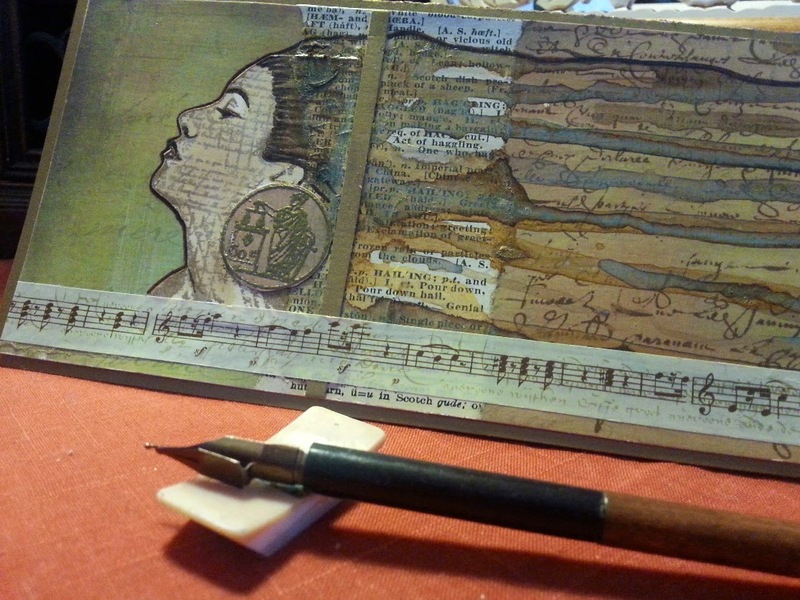 Here is a mixed media card using a Paper Artsy Hot Picks stamp set and some Lindy’s Stamp Gang sprays that have been applied with a dropper. There is always an unpredictability when using a spray or a dropper. This is the exciting part for me, when the medium seems to have a life of its own. Be brave and give it a go. I think you will be pleased with the result. 1. 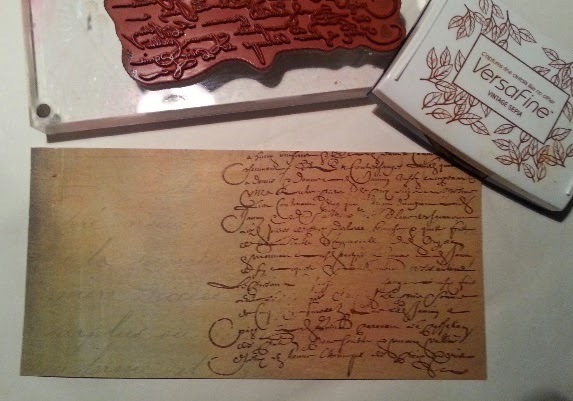 Cut a 10cm X 20cm piece of ivory cardstock and a 10cm X 20cm piece of Paper Artsy Chatsworth paper. Using matte medium join them together back to back for strength. 2. Stamp the script background stamp from Paper Artsy 1304 on the right hand side of the Chatsworth paper using Versafine Vintage Sepia stamp pad. 3. 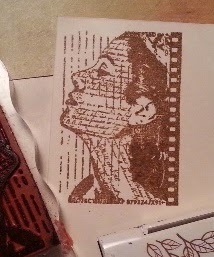 Stamp the face from Paper Artsy 1304 on a spare piece of ivory cardstock. 4. 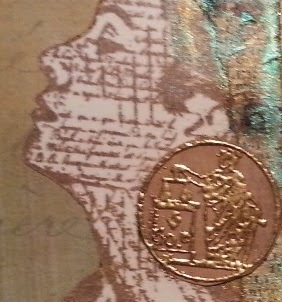 Fussy cut around the face and the straight edges along the side and lower edge of the stamped image. 5. Tear a piece from a vintage dictionary page (approx. 4cm wide x 10cm tall). 6. 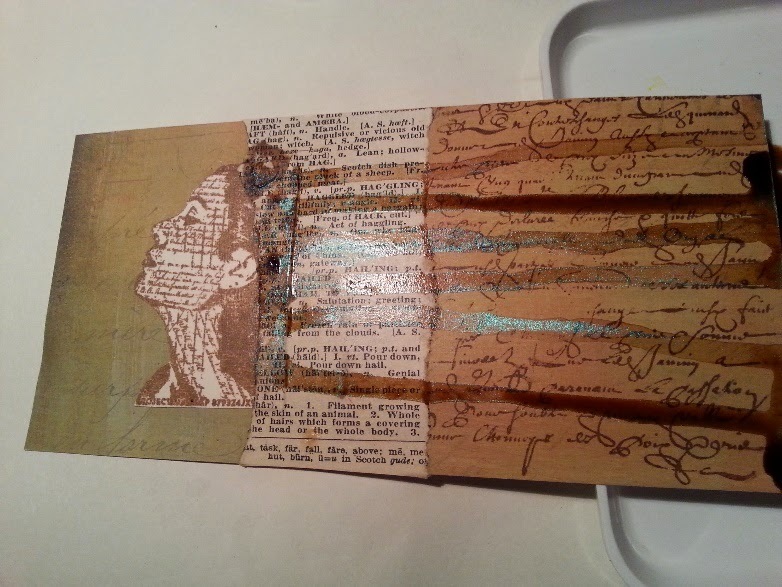 Create a collage using the face image and the dictionary piece on the Chatsworth and script background. Use matte medium to paste in place. Apply matte medium over entire card. 8. 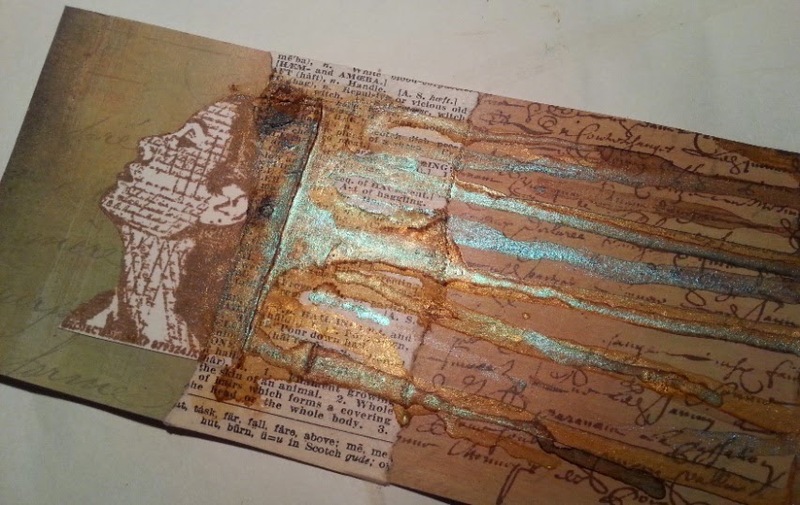 When dry, repeat with Lindy’s Stamp Gang Vintage Moon Shadow Mist Tawny Turquoise. Pick up some of the excess medium with a small paintbrush and paint in any remaining parts of the stamped hair. 9. Stamp one of the smaller coins from Paper Artsy 1304 on a scrap of Chatsworth paper with Versafine Vintage Sepia stamp pad and heat emboss with Just Gold Alison Ellis Design embossing powder. Cut around the outside of the image and apply below the ear using matte medium. 10. Cut a strip of gold cardstock 5mm wide and paste in place. Add some washi tape. 11. Smudge a little white gesso over the face with your finger to tone down the text. When dry add a light wash of diluted sepia ink for shading. 12. Crisp up the design with a brown brush marker by drawing around the profile and the hairline. 13. Cut gold cardstock to fit the card adding a 5mm border all around. I hoped you liked my project and got inspired to give it a go! Love the way the sprays have created the hair effect ! !